Please complete the following rental form and submit the form. 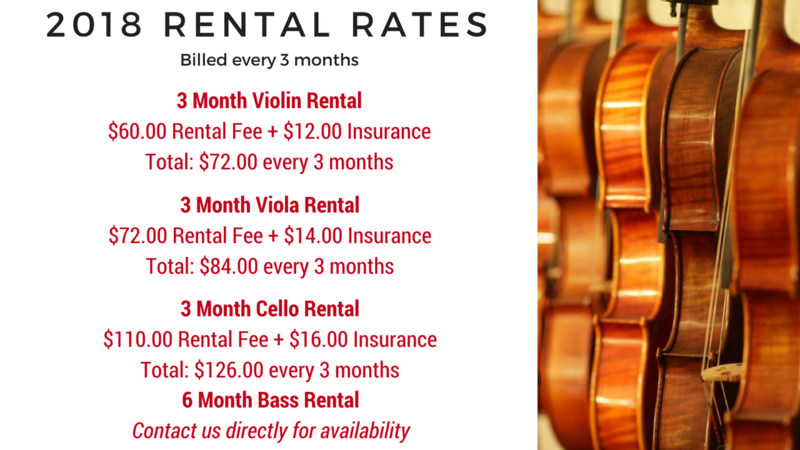 Upon receipt of payment, rental form, and approval, an instrument will either be on hold for you to pick up at one of our shops, delivered to your school, or shipped to your home. Full size (adult) 3/4 1/2 1/4 1/8 1/10 1/16 1/32 16.5" 16" 15.5" 15" 14" 13" 12" 11"
Upon receiving your application, we will either charge your credit card information on file or contact you for payment if current information is out of date/inactive. We will need an active Visa, Mastercard, AmEx, or Discover card on file at all times. If you have any questions or would like to provide payment info now, please give us a call at (800) 766-0936. If your credit card has expired or changed, please contact us with your new card number.